Which is the best Zelda game? As Breath of the Wild just came out, this is the perfect time to make a Zelda topic. Discuss anything to do with Zelda here. Also, Twilight Princess is the best video game ever! That or Breath of the Wild. Last edited by Agent.MontyWhittaker on Tue Feb 20, 2018 10:04 pm, edited 6 times in total. 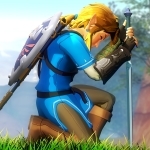 I've played about 10 Zelda games and almost all of them were gold except for Spirit Tracks (which could be added to the list along with Phantom Hour Glass ). And GASP! Twilight Princess is the most beautiful game! It's SO good! What's your opinion of Skyward Sword? Pretty good, but you obviously haven't played Adventure of Link or Triforce Heroes. Sadly, I have not. I did watch Triforce Heroes when it first came out and was a little bored. Maybe it's one you have to play. Have you played Majora's Mask? Your opinion? Good game, but weird. The mask is the villain, what? I haven't played it yet. ;_; It looks so good tho! Have you played The Wind Waker?? Played 'em all, if you were wondering.Wind Waker was good. Who's your all time favorite character? Triforce Heroes is actually really fun to play if you get two friends with you. Fortunately, download play works with it, although the people playing it via download are only permitted to have two outfits. It is insanely boring to watch, however. The best (worst?) part is that you share hearts, you only take full hearts of damage, and you all share a life meter. The magic meters are all separate, though. And you can throw each other off cliffs. ...And yes, Breath of the Wild Is amazing. The side-quests are some of the most fun things in the world. You can build you own town! Investigate a robbery! Help a few couples get together! Read Zelda's diary! Get the Master Sword before beating your first dungeon! Legend of Zelda is amazing! My top favorites are Twilight Princess, Skyward Sword, Breath of the Wild and Ocarina of time. Last edited by Agent.MontyWhittaker on Wed Aug 01, 2018 12:47 am, edited 3 times in total. Even though it gets a buttload of flack, I loved playing Skyward Sword. The motion controls were awful, but the game itself was great. I'd love to see them remake it on a different console. Last edited by Agent.MontyWhittaker on Thu Jul 19, 2018 1:45 pm, edited 3 times in total. I got a 2DS in great condition this summer for $30 and I've been playing Majora's Mask. Link to the Past is the best game in the series! The only Zelda game I have ever cared about was actually the first one I have ever played: Link's Awakening DX. None of the others could grab me in the same way and I found them pretty underwhelming in comparison... I'm not sure why, the same things that hooked me to the DX seemed to be present in all of the rest, but the presentation felt lacking nonetheless. LUCKY!! I payed 90 for mine! At least it was brand new though. I haven't been into Zelda, I've been a Mario and Sonic kind of Nintendo Fan. But I saw BotW and I decided if I ever get a Switch, that is the second game I am getting next to Super Mario Odyssey. It looks so absolutely amazing! Well, it is, but honestly you should play some Metroid. For me, Ocarina of Time will always be my favorite. I really like the Spirit Temple.